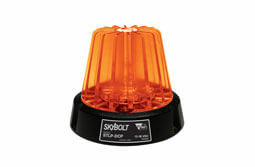 The Skybolt STLP mini-strobe is a bright new warning beacon from Tri Lite Mars. Driven by a powerful LUXEON LED, high intensity "pops" of light are seen through the finned lens of this unique beacon. A patented "light pipe" design ensures that light travels easily from an internal LED through the translucent outer fins, catching the eye of pedestrians, motorists, or shop personnel. Made from rugged polycarbonate, it's virtually indestructible! Skybolt is watertight and will operate in all types of weather. Ideal uses include warning signaling for safety and utility vehicles, lift trucks, elevated work platforms, and heavy equipment. Choice of clear or colored lenses to indicate warning for a variety of 12-36VDC signaling applications. Available in permanent or magnetic mounts. 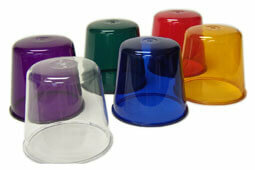 Dome colors available: Amber, Blue, Clear, Green, or Red. See the quad strobe pattern in action!